The Sony Cyber-Shot DSC S500 mingles 6.2 megapixels with a 3X optical zoom and 6x digital zoom lens design, excellent wide-angle shooting ability, 25MB internal memory for image in-camera storage, and a bright 2.4 inch TFT LCD screen which enables you to check your pictures and share instantly. The camera also features a slot for Memory Stick Duo and Memory Stick PRO Duo if the 25MB internal memory isn’t quite enough for you. The DSC S500 from Sony is powered by the optional Sony NiMH rechargeable batteries, enabling you to capture up to 350 shots from one charge, the shooting capacity that’s comparable to 10 rolls of 35mm film. 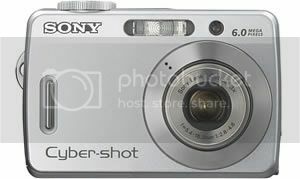 The Sony S500 digital camera weighs just 146 grams and measures 92.4 x 62 x 31.2 mm. Currently there is no information available for the price and where and when you can buy the Sony S500 camera.